Posted on June 5, 2017 by admin wrote in Business, Employement, Staffing Agency. Getting fired from a job is one of the most traumatic life events a person can face. Every day, people from all walks of life face this ego-bruising, life-changing event sometimes unaware of how their termination could have been avoided. As a top staffing firm in New York, we feel we would be remiss in our job of helping you to secure a position with a top firm without also alerting you to some of the common pitfalls to success. Therefore, we would like to share with you some situations that commonly lead to termination and dismissal. Being caught lying on your job application or resume: A lie is a poor way to say hello and a resume/application is a greeting to your prospective employer. Once hired, your resume remains in your file and can be examined at any time. Moreover, some studies show that as many as 89% of employers check job references. Moral: Always be truthful on your application/resume. Inability to get along with others: You may be a lone wolf in your personal life but when it comes to nearly all business some amount of team effort is needed. Employers quickly note employees who habitually get into fights and disputes with co-workers. Learn the team dynamic of your workplace and develop your social IQ to avoid being singled out for discipline or dismissal. Poor performance: Every workplace has metrics it uses to gauge how well employees perform their jobs. Employees who make mistakes often or perform their task too slowly are always subject to termination. Be sure you are qualified for the position for which you seek and that once you do acquire the position that you take advantage of any courses or training that may be available. High absenteeism rate / Being late often: Employees who are frequently late or absent cost companies money. Additionally, employees who are late and/or absent create a burden to their co-workers who must often work harder to compensate. Drug and Alcohol abuse: Employees who abuse alcohol and drugs create a workplace environment that is unproductive and that lowers morale. Although some workplaces have programs to help employees who have alcohol or drug problems, most find it more efficient to terminate such employees. Finally, one of our jobs as a top staffing firm in New York is to see to it that our workers secure jobs in which they can excel. 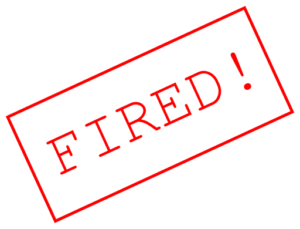 However, this is only possible when employees avoid workplace activities that can derail their careers and cause problems in their personal lives as being fired does. Know the rules of your workplace, read through the employee manual and do everything you can to avoid behaviors that can lead to termination.